It’s been a long while since I have posted a bag tutorial! Today I am posting a new reversible bag tutorial for the cube tote bag that I made for the Le Depart by Koizumi fabric Giveaway a few months ago. It’s really roomy and easy to make, and I actually do use this everyday because it’s so easy to find my stuff in it. When the top is closed the width becomes 50cm wide, and the base is still a 25x25cm square. depending on how slouchy or stiff you want your bag to be. I used Fabric A and B as contrasting panels on the outer bag, and Fabric C referred to as Lining in the tutorial. 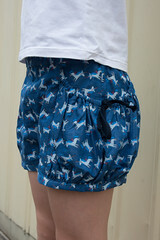 But as it is a reversible bag, you can always flip the inside out and have the cute Poolside Palms fabric out. So just mix and match anyway you wish. 2 pieces of Fabric A, 2 pieces of Fabric B, 4 pieces of Fabric C, 4 pieces of medium weight interfacing. Apply interfacing to the outer pieces (in my case i applied it on Fabric A and Fabric B because they were softer and needed more structure.Then it’s time to sew! Follow the sewing video tutorial below.ETA : I went back to Youtube to check that the link to the drafting video works, and was shown a suggested link to the making video by the same designer that showed you how to make it! I must have missed it the first time or I wouldn’t have spent time making my own video. In any case, I already made the video, so I’ll just put it up and you can choose to view either one to learn how to make it. Watch the version by Diy Soho here, or watch mine below. It’s up to you. and here are some pictures of the final bag! The base of the bag. and the reverse side. All ready for the beach! The poolside collection from Cotton+Steel is perfect for this project! You can find it at Nekoneko.co, plus a whole lot of other Cotton+Steel fabrics. This pattern had its roots 9 years ago, when I first made attempted to make a mash up dress+chinese collar for my then 3 year old daughter. Being inexperienced, I created a front flap opening, but sewed up the gathered skirt at the waist line. Needless to say, it was a struggle getting in and out of it, haha… That idea was revisited a few years later, you can imagine how traumatized I was at my failure, but I was determined to get it right, by copying the side opening from a store bought Qipao my husband bought for us from his business trip to China. I finally understood how it worked and so created a free pattern (click here for the free pattern) and launched it in January 2014, plus sewing video tutorials (click here to watch the videos on youtube) to make it easier to understand. Anyway, this year, Chinese New Year falls on 28th Jan which is rather early. It seems like Christmas just came and went and I just got settled in the new school routine. But it’s based on the lunar calendar so it’s not up to us to decide ;P I am still struggling to spring-clean, and am still sewing our new outfits for CNY2017. I have lowered my personal expectations for this year and I’m probably only going to make one outfit per person instead of 2. I just hope I can make it in time! In the meantime, have a look through and get inspired by these creative ladies from our local sewing group – The Sewing Network. Click on the arrows to see the next slide. The copyright of photos belong to the owners as stated in each picture. If you wish to be included in the gallery, just message me on Facebook or email me with your photos. Enjoy and be inspired! This is part 2 of the series on Making a Ladies Qipao / Cheongsam / Chinese Dress. In the first part, I have included free pattern downloads in standard sizes S,M and L. But as I mentioned yesterday, it is hard to achieve a perfect fit unless you are lucky enough to fall within the standard size dimensions. This article should help those of you who are slightly off the standard sizes, or straddling between sizes and don’t know which to choose. This may not work so well if you have very drastically different measurements for bust/waist and hip. (for example Barbie ;P) In which case you will need a custom pattern which will accommodate a fuller bust. If you are only 1-2cm off for each measurement, it is still good enough as you can make adjustments to the darts to achieve perfect fit without having to alter the pattern. Pick the size which is best for your bust area and make adjustments to the waist darts. If the hips are too loose after making your toile, use a larger seam allowance till it fits you the way you want it too. That is why making a toile is important. However, if you are straddling between sizes (like me), here is a quick and dirty way of making adjustments to the pattern. I will suggest first of all, choosing the pattern based on the bust size that fits you best. This is because the upper bodice includes waist and bust darts, both of which are already positioned to shape the bust properly. It will not be as easy to modify the darts on the bodice as this requires a lot more shifting of points and it will also affect the neckline which in turn affects the collar. As I mentioned earlier in the first paragraph, this method will not work if you are say like Barbie. Super skinny (therefore small neck and shoulders) but big bustline, because the necklines and bust for larger sizes increase proportionately. So if you choose a XL bust but your neck is small, then the collar will not wrap your neck nicely. So to repeat myself, this method works if your measurements are not more than 1 or 2 sizes apart. For example, my personal measurements fall within M and L, so I will use the M bodice size and make waist and hip adjustments accordingly. This is how I do it. We will make adjustments to the skirt pattern piece (original pattern without seam allowances) first. Lines in pink indicate new measurements and new lines. Use the original patterns on a larger piece of drafting paper to trace out the new pattern pieces. You will need the following measurements – your waist (w) and hip circumference (h). All measurements in my diagrams and calculations are in cm. I am using Size S pattern as an example, where the original waist size is 64cm. I will change this to 67cm. The hip size will be changed from 88cm to 92cm. Working on pattern piece E for the skirt only. Place your original pattern piece on a larger piece of drafting paper. From the centre line, draw a perpendicular line along the waist line, to the length of 19.25cm and mark this new point on your drafting paper. Do the same for the new hip line – mark at 23cm. From the hip line, extend a perpendicular line to the hem. You can make adjustments to the length. Just measure the desired dress length from your hips to wherever you want it to end. From the centre line, extend a perpendicular line towards the line you drew in step 3. Where lines 3 and 4 meet, draw a 1cm square inside the intersection. Draw a slight curve joining the new hip line to the top left corner of the square you drew in step 5. Draw a slight curve for the hem from the centre line to the top left corner of the square. Make sure that the curves you draw for 6 and 7 flow from one point to another in a gentle curve, otherwise you will get an odd shape along the side seam. Now cut out the new skirt pattern and join it to the back bodice pattern. Draw a line down the armhole to the new waist line. You can draw a slight curve too that joins to the waist line. Now use the new skirt piece and attach it to the front bodice. Draw a new line down the armhole below the bust dart to the new waist line. Note that for the upper bodice pieces, there is only a slight amendment which is to widen the waist line. You don’t have to retrace the entire bodice on drafting paper. You can just make the adjustment on fabric if you wish. And that’s it! Quite simple actually, let me know how it works out! Show me some pictures by hashtagging #MadeMyOwnQipao on Facebook/Instagram! Next part of the series, I will talk about some variations and embellishment ideas for the Qipao. This will probably be up only next week as I need to get sewing too! Ever since my first post on making the Girls’ version of the Chinese Qipao in January 2014, I have received lots of feedback and seen lots of pictures on social media of the dress. I have been thinking about making the same pattern for adults for a long time, but was hesitant to do so because the adult’s version is a much more challenging dress. It is a fitting dress that hugs your curve (Note: not the same as tight!) It would be hard to create a standard set of patterns that will achieve the same effect. This is the same reason why most people choose to tailor make their Qipaos, because you simply need it to be made to your size. Some photos from my own testing. Note that this is still an unfinished piece, as I ran out of bias while sewing and I have no red buttons to complete the dress! Hence the front piece is not quite fixed in place. So, emboldened by my personal “success”, I present to you, a set of free Qipao sewing patterns for your personal use. I can only test my own size, and as I’m between a M and L these will be available for download. I used standard measurements from the Winifred Aldrich “metric pattern cutting for women’s wear” as well as a Qipao sloper diagram to draft these patterns, but as I mentioned earlier, that in order to achieve perfect fit, you will need to make some adjustments for your own shape and size. I will be writing up another post about adjusting the standard patterns for your own measurements later on. So watch out for it. Note that these patterns are free for testing, please leave me your comments below if you find anything missing in the patterns. For fit issues, please refer to the section below on Adjustments for Fit. I will now give you the materials and instructions on making the toile. This post will focus on getting the right size and right fit. Very important! Make a muslin/toile first! This is very important. Especially if you are intending to use a special fabric. Do not cut into it until you are sure your qipao fits you well! I used a cheap $1.40/m cotton for my muslin. Long stitches without backstitching the ends so that I can quickly undo it and make adjustments. The following describes the Materials and instructions for making a toile. Once you have perfected the fit, use the toile to work on your nice fabric to make your own Qipao. At least 1.5 m of muslin/cotton/anything you can cut into without crying if you make a mistake. Preferably a plain light colored fabric that you can easily make markings on. An invisible zipper that is long enough to extend from your underarm (side of bust) down to the hips. Bias tape – if you want to practice attaching the bias on the curved edge of the qipao and collar. For beginners you might find it a little challenging to get a smooth flat finish especially when the front bodice curves up to the collar, so it might be good to test it out on the muslin, but for fit purposes it is not neccesary to finish the edge with bias. Take proper measurements of your bust, waist and height. Make sure the tape measure is parallel to the ground and around the widest part of your curves. Do not tighten the tape measure when measuring, it must be just resting on your skin. Be truthful to yourself. Nobody will be able to tell the exact measurements, but if you hold your tape measure too tightly around your tummy for example, then the qipao will look tight at the tummy when finished, which makes it look ill-fitting. Using these measurements, refer to the size chart and select your size. Please visit my PDF pattern store – Porcupine Patterns to download the patterns. If you have downloaded the PDF pattern, you will realize that I have separated the skirt piece from the bodice pieces. The reason for doing this was to use less paper, which not only means saving the environment, but also easier piecing. My pattern only uses 16 pieces in a 4×4 grid. Use recycled paper whenever you can since you are going to cut it up anyway. You will need to use the skirt piece for both the front and back pieces. Here’s how. Let’s start with the back pieces. The front pattern piece is traced in 3 steps, as follows. Note that the front piece is traced on the right side of the fabric. Note the orientation of the front piece. The curve should be running down the right side of the chest towards the right arm. Flip the skirt piece to match the other side seam. Seam allowances are NOT included in the pattern. This is to cater for possible pattern adjustments. Do all the pattern adjustments before adding on seam allowances. Follow the diagram below to add on your seam allowances. Transfer markings to your muslin and cut. Now you are ready to sew! The first thing you have to do is to sew up the bust darts and the waist darts. Use a long stitch so that you can undo the darts for fine adjustments if needed. Other than that, the process of sewing up the rest of the Qipao is pretty much the same as the kids version. 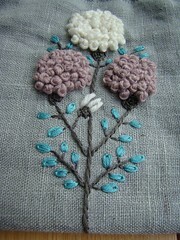 So you can follow the sew-along / video tutorial series. However, do note that my way of attaching the collar is not the traditional way of sewing on a collar. 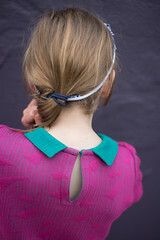 It was my one step short-cut way of preventing the dreaded collar-not-matching-neckline nightmare, and also a quick and easy way to hide the raw edges without having the baste the inner collar. So if you are not used to my method, please feel free to use my free patterns and attach the collars in your favourite way. If you are in between sizes, read part 2 here about making adjustments for your own measurements. I will also do another write up about variations of the classic design, adding sleeves, and discuss decorative ways of embellishing the Qipao when I have more time to do so. Oh and one more thing. If you do make a Qipao using this pattern or the kids version, do post it on Facebook/Instagram with the hashtag #MadeMyOwnQipao to be eligible for a very special giveaway at the end of the year! Welcome to Day#2 of our sewing video tutorial. Do you have all your materials ready? Let’s start! To begin with, please refer to the layout diagram below, for the positioning of the different parts of the wallet. You will need to mark the position of the velcro strips on the outer and inner fabrics. Note the orientation of the inner (on top) and outer fabric (below). This is because the two pieces will be sewn with their wrong sides facing. Layout and positioning of pockets and velcro. Click on image to zoom in. Make coin compartment – Sew front piece of coin compartment to the bottom edge of the zip. Sew backing piece for coin compartment to the top edge of the zip. Open up the two fabric pieces so that right sides are facing up. Topstitch the fabric onto the zip. Foldover the backing piece so that the short edges are aligned. Set aside. Make ID holder – Clip the two strips of bias in place to the longer sides of the plastic sheet. Sew down one side, with the bias sandwiching the plastic sheet. Set aside. Assembling the inner fabric piece. Place coin compartment, right sides aligned (as referred to in top diagram), clip in place. Baste the coin compartment to the inner fabric on the right and left sides, with a 0.5cm seam allowance. Next, place the plastic sheet 1cm away from the coin compartment, clip in place to the inner fabric. Sew the other side of the bias (the side that has not been sewn) so that the bias sandwiching the plastic sheet is sewn down to the inner fabric all in one stitch. Position Velcro pieces – using the layout diagram above, mark with a washable fabric marker/chalk, the velcro hook and loop tape positions respectively on the outer and inner fabric pieces. Sew the velcro pieces on. Finish top edge of inner fabric – using the cotton twill tape, cover the edge of the inner fabric and sew down with a 0.7-0.8cm seam allowance. Assembling the wallet – Place outer fabric with right sides facing down (note orientation of velcro), place billfold lining fabric on top (wrong sides of fabric facing each other), and stack the inner fabric with the sewn on ID holder and coin compartment on top of it. Align the bottom edge of all pieces (the bottom edge is the one nearest to you). Important! Check the position of the velcro strips. Now fold up the wallet to check the orientation of the velcro. If it is correct, sew a 0.5cm seam allowance basting stitch around all 4 sides to hold all the layers in place. Finish – Using the cotton twill tape, sew all around the raw edges of the wallet, making sure to sew through all the layers. I feel a headache reading what I just wrote 😛 It’s hard to imagine orientation and right sides and wrong sides without actually seeing it! So please watch the video, it will make things so much clearer. If you have a fast internet connection, watch in HD! I hope you enjoyed this quick and easy sewing video tutorial. Even if you did not sew along, bookmark the page for you might want to make this one day. Happy sewing and stay tuned for my next sewing video tutorial next month. I will be sewing using a pattern from one of my Japanese sewing books!